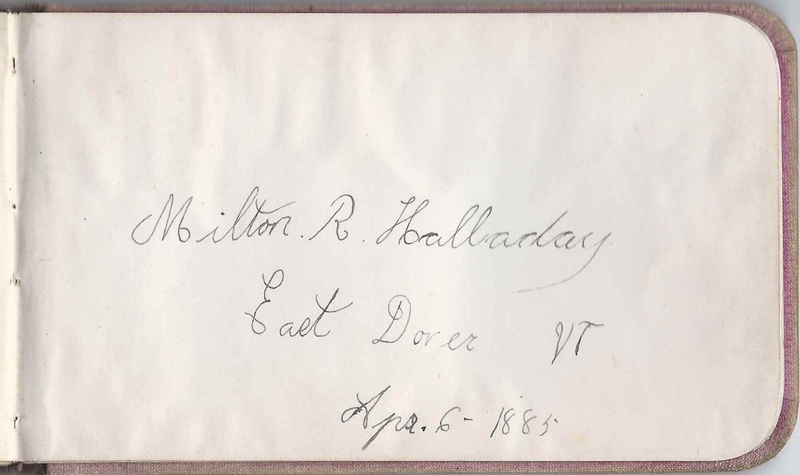 1880s autograph album of Milton Rawson Halladay of East Dover, Vermont. He became a renowned political cartoonist. 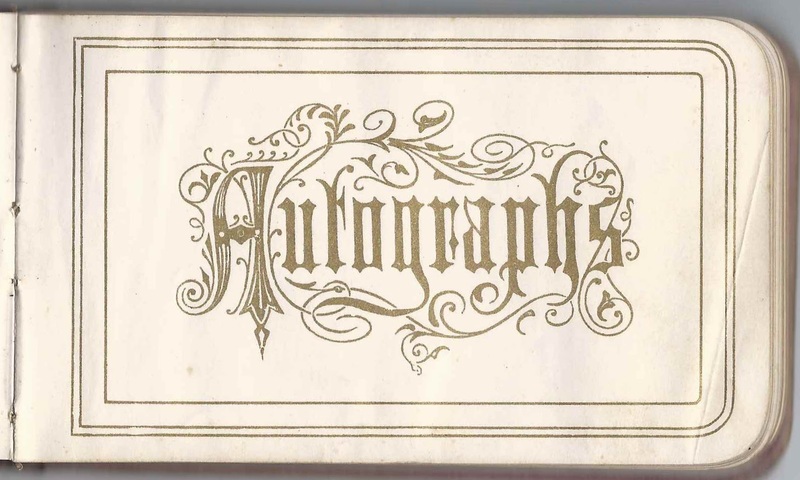 Milton, and some other members of his family, were of two minds when it came to the spelling of his surname, as you can see from the two pages that Milton signed in his album. 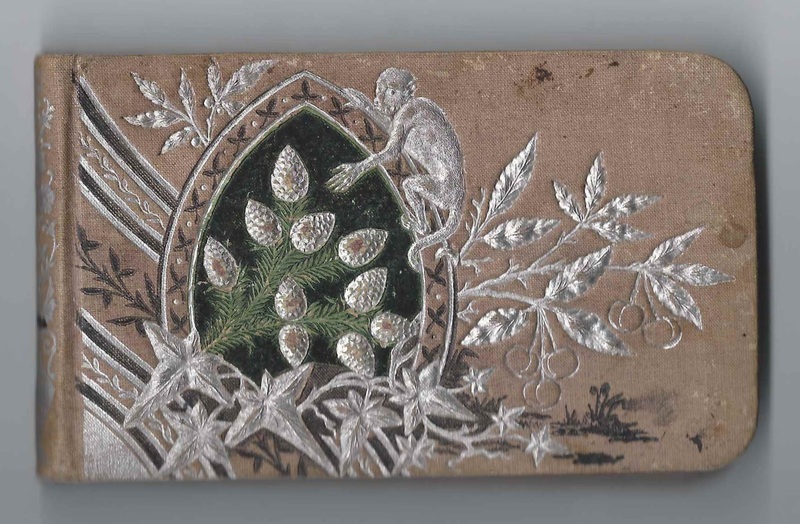 The album is approximately 5-1/4" x 3" and contains the sentiments of 35 of Milton's relatives, friends, pastors and schoolmates. An alphabetical list of the signers appears at the end of this post. Milton Rawson Halladay was born 16 December 1874 at Dover, Vermont, the son of Wells Calvin Halladay and Lydia C. (Rawson) Halladay, who were born at Brattleboro, Vermont, and Dover, Vermont, respectively. 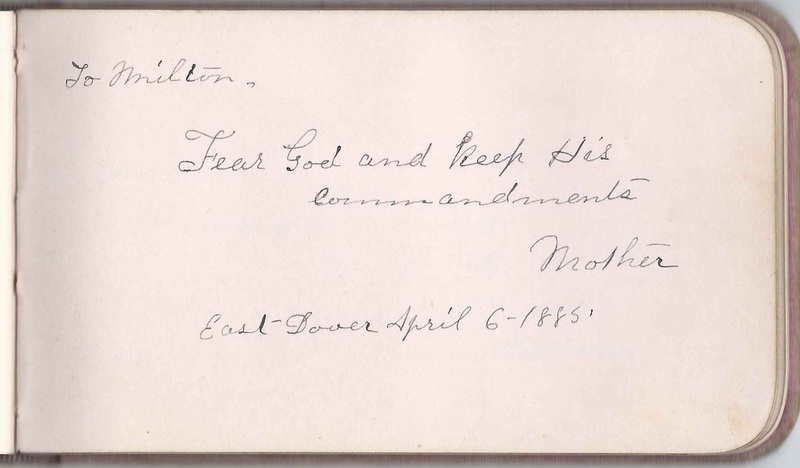 Lydia signed a page in her son's album at East Dover, Vermont, on April 6, 1885. 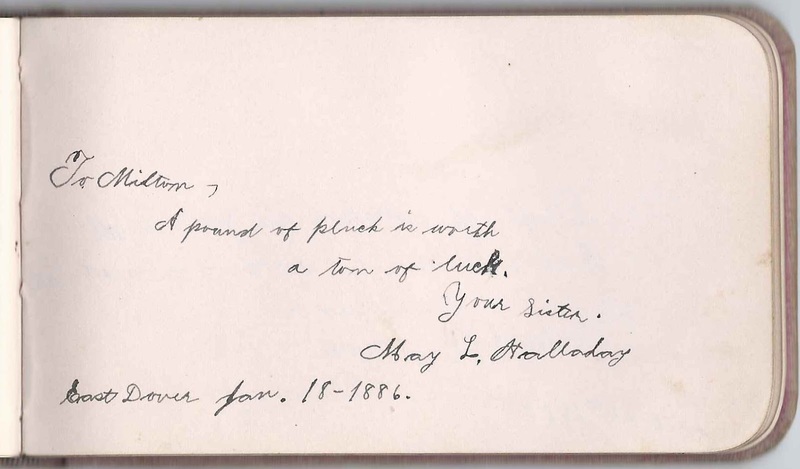 Milton's sister, Mary Lovisa Halladay, "May", signed a page at East Dover, Vermont, on January 18, 1886. She would marry Lucien M. Hunt. 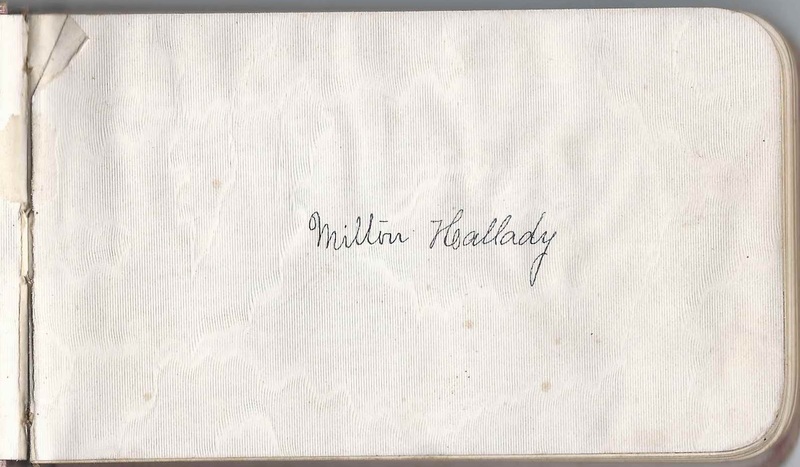 Several of Milton's cousins signed pages in the album, including siblings Orlando Wilbert Halladay and Edna Juliet Halladay, children of Rebecca E. (Eames) Halladay and Wilbert Ellis Halladay, who was a brother to Milton's father Wells Calvin Halladay. 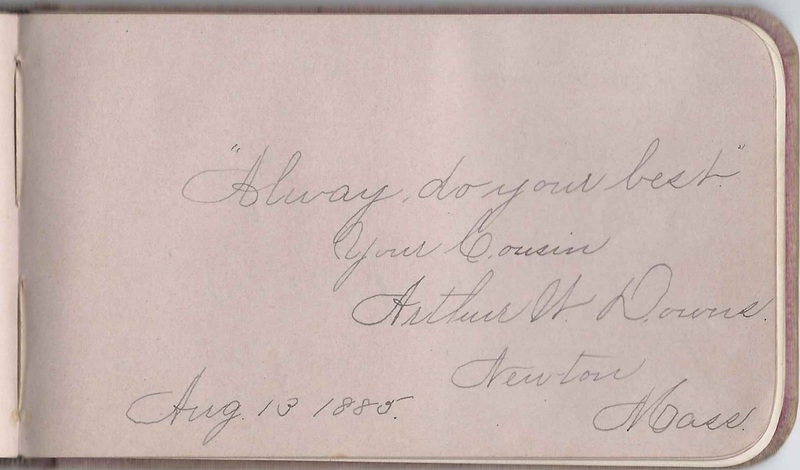 Cousin Arthur W. Downs of Newton, Massachusetts, signed a page on August 13, 1885. His parents were Congressional Medal of Honor recipient Henry W. Downs and Lovisa (Rawson) Downs, who was a sister to Milton's mother Lydia C. (Rawson) Halladay. I learned from a press release for an exhibition in 2012 of the works of Milton Rawson Halladay and his son Allan Wells Halladay that Milton's artistic skills grew to the point that his parents, though of limited means, found a way for him to attend art school in Boston. He eventually became a political cartoonist until the World War II era. On 2 October 1902 at Providence, Rhode Island, Milton Rawson Halladay married Blanche Edith Hitchcock, daughter of Alvah A. and Eva D. (Gilpin) Hitchcock. Blanche was born 2 April 1881 at Providence, Rhode Island. The couple would have four children, one of them the above-mentioned Allan Wells Halladay. One of Milton's cartoons, which commemorated the death of Thomas Edison, was the runner-up for a Pulitzer Prize. The album included a clipping with the assertion of Col. Albert Clarke that Lt. Charles W. Randall of Vermont was the youngest officer in the Civil War. Rev. H. V. Baker of South Windham, Vermont, signed on April 9, 1885. It was his wife, presumably, who signed the right facing page as Mrs. S. M. Baker. Mrs. S. M. Baker, signed on May 21, 1885. It was her husband, presumably, who signed the left facing page as Rev. H. V. Baker. C. F. Brown of East Dover, Vermont, signed on July 14, 1889; presumably Postmaster Charles F. Brown, whose wife Hattie A. (Houghton) Brown signed the right facing page. Mrs. C. F. Brown of East Dover, Vermont, signed on July 14 [no year written, but her husband signed the left facing page on July 14, 1889]. Presumably Hattie A. (Houghton) Brown, whose husband Charles F. Brown signed the left facing page. Lettie E. Corse of West Dover, Vermont, signed at East Dover, Vermont, Fall Term, 1888. Was she perhaps the teacher? Arthur W. Downs of Newton, Massachusetts, signed on August 13, 1885; Milton's cousin. He was the son of Congressional Medal of Honor recipient Henry W. Downs and Lovisa (Rawson) Downs. Lovisa was a paternal half-sister to Milton's mother Lydia C. (Rawson) Halladay. Dan M. Hale of East Dover, Vermont; likely Milton's schoolmate as Dan's message is in Latin. Belle L. Hale of East Dover, Vermont, signed on December 22, 1887. Milton R. Hallady of East Dover, Vermont; album owner. 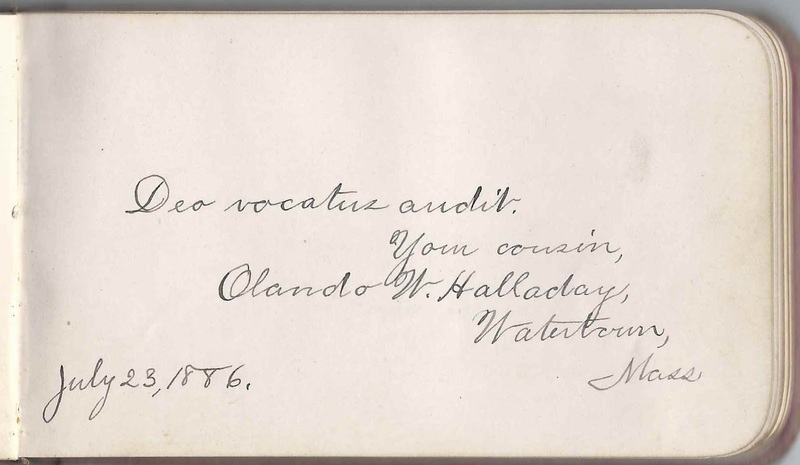 Most records have his surname as Halladay, and he himself signed another page in the album and spelled his surname as Halladay. 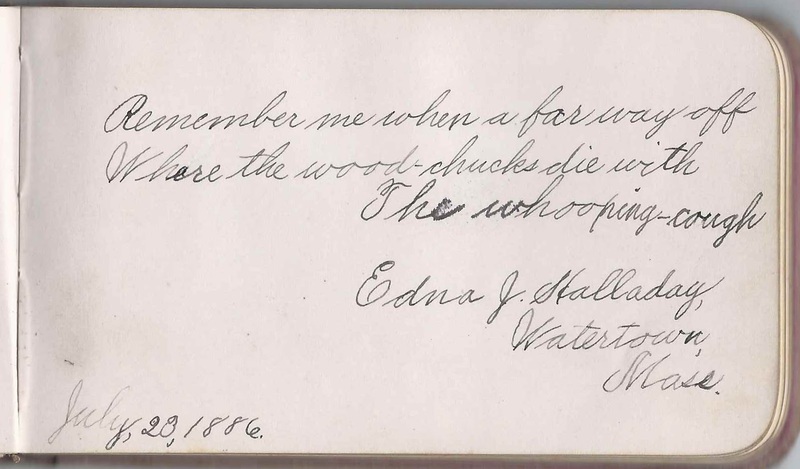 Edna J. Halladay of Watertown, Massachusetts, signed on July 23, 1886; Milton's cousin. Edna Juliet Halladay, daughter of Rebecca E. (Eames) Halladay and Wilbert Ellis Halladay, who was younger brother to Milton's father Wells Calvin Halladay. Maud I. Harris of Dover, Vermont, signed on December 22, 1887; presumably Maud Ida Harris. L. Kinney, signed at East Dover, Vermont, on February 17, 1885; presumably Rev. Luman Kinney, whose wife, Ellen B. Kinney, signed the right facing page. Ellen B. Kinney, signed at East Dover, Vermont, on February 16, 1885. She was Calista Ellen (Bennett) Kinney, wife of Rev. Luman Kinney, who signed the left facing page.